The KRI Community Connection is our registry to recruit kidney patients for our research studies. Start by filling out our questionnaire and indicating that you want to get involved in research. Click here to learn more. Visit Northwest Kidney Centers’ website for upcoming events in the Seattle area. 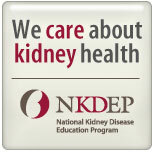 Northwest Kidney Centers provides free classes for people with kidney disease at various stages. Click here to learn more. The National Kidney Disease Education Program works to reduce the burden of CKD, especially among communities most impacted by the disease. Click here to gain access to a wealth of information for people living with kidney disease, and other valuable resources. We invite you to be part of the Kidney Research Institute conversation online, and we look forward to interacting with you on our Facebook page and via Twitter! Before you post, please make sure to read our guidelines. Click here to learn more.